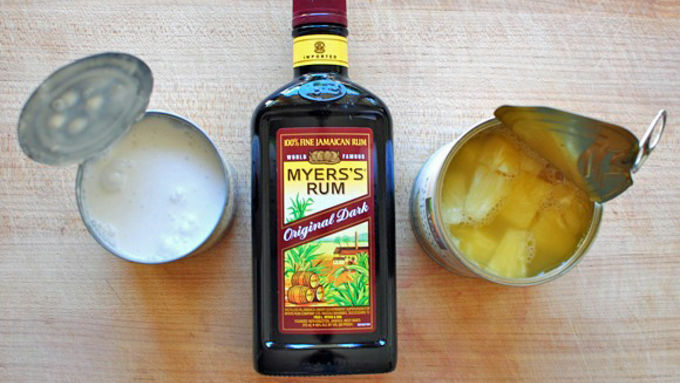 In a medium bowl, whisk together the coconut milk, pineapple juice and rum. Transfer to a small saucepan and keep on a light simmer for about 5 minutes. Season the pork on both sides with the salt and pepper. Preheat grill to high. Place the chops on the hottest part of the grill, sear for 2 minutes on each side. Then move the chops to the cooler part of the grill and cook an additional 4 minutes per side. Start basting the chops with the pina colada glaze once they're on the cooler part of the grill. Let pork rest about 5 minutes. Serve with your favorite side dishes. Grill, grill, grill. It's summmmaaaaaah! And the grill is poppin'. Wait, poppin' isn't right. It's smoking? Like, smoking hot? Smoking busy? It's hoppin'? Like you know when a place is super busy you say, it's hoppin'? Whatever. 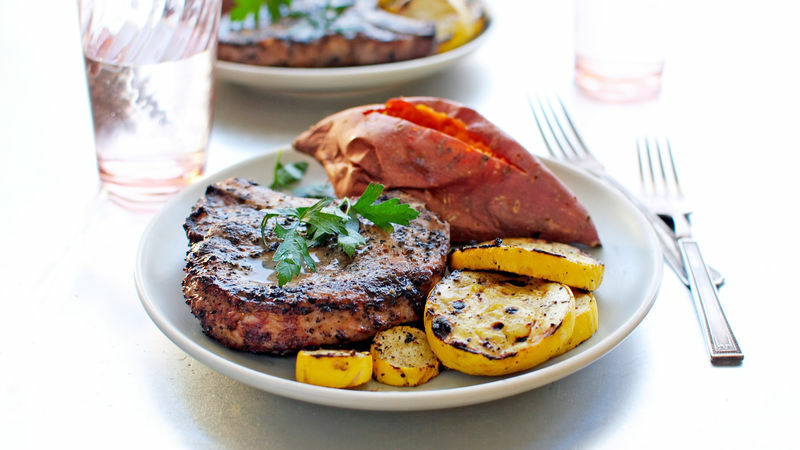 It's summer and you need to grill. 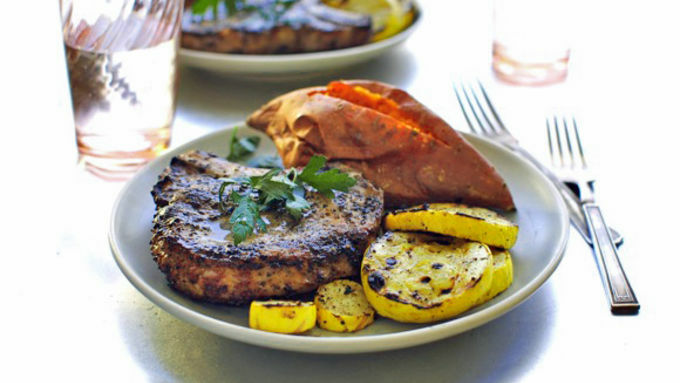 So this is what I have for you - Piña Colada Grilled Pork Chops. And don't worry, the booze burns off while you're grilling. Alright, this is so super easy. Grab some coconut milk, dark rum and pineapple juice. I just bought a can of pineapples and used the juice. And I snacked on the pineapple while making the glaze. Boom. Just whisk a few tablespoons each of the stuff and simmer it for a few minutes. 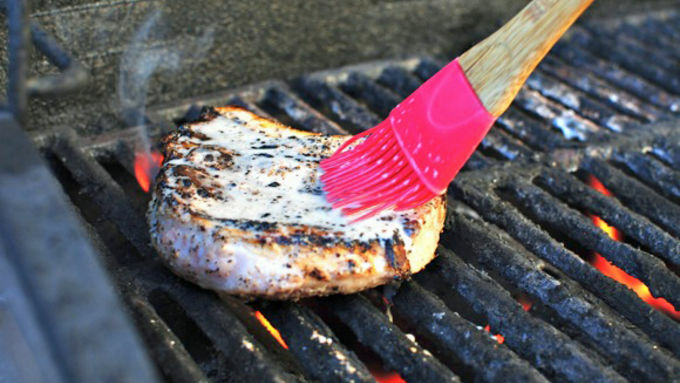 Then you just grill and baste! Get the chops good and seared, then baste them with the glaze for a few more minutes. So easy. And that's it! I baked a couple of sweet potatoes and grilled some squash to go along side, but you're more than welcome to eat anything you want.